Often overlooked as a major hazard, the gases in the workplace contribute to nearly all fires and explosions in the oil and gas industry. People seem to forget that the very thing keeping them alive - the atmosphere - if not sufficiently monitored can lead to damaged assets, environmental pollution and fatalities. Health and safety is a key objective for organisations in the oil and gas and petrochemical sectors. As one of the most strictly regulated industries in terms of health and safety, the potentially hazardous nature of the activities and the byproducts generated as a result of those activities establish cause for concern. Generally speaking, most of the major global players have some degree of Hazards Effects Management Processes (HEMP) in place, which potentially incorporate process safety and asset integrity. One would hope that all these practises are integral to the management system and go a long way to providing a safe and healthy working environment. Demand for gas detection equipment depends on the dynamics of major end use industries such as oil, gas and power generation. As legislation evolves, the demand for gas detection is driven by the increased focus on reducing risk to levels as low as is reasonably practicable (ALARP). Industry’s demand is now determined by the increasing focus, and rightly so, on personnel and asset protection, whose needs are both triggered by process requirements, work procedures and the complexity of operations. Industry needs to balance the developing and considerable emphasis on the importance of monitoring the environment at a given location, with two aspects of safety: environmental and personal. These two areas further magnify the growth of monitoring. This trend is important primarily because what isn’t measured can’t be controlled. Monitoring the atmosphere is further supported by the rise in production, transportation and use of oil, gas and petrochemicals within the sector, as observed in the increase in incidents and accidents. This alone promotes new technology and development of newer applications for gas detection, and is not confined to fixed monitoring. There is an emerging and a sustained growth in handheld and portable gas detection equipment. The oil and gas sector has traditional applications for gas detection such as confined space entry, pipelines, wells and sewers. There are emerging application areas that could also be used within oil and gas depending on the drivers; for example, waste treatments and emergency response. While safety is paramount, demand for safety apparatus can sometimes be influenced by a wide range of economic variables. Demand for gas detection equipment, however, is less susceptible to economic movement than other safety apparatus as the industry holds an unflinching focus on activities that are seen as critical from a safety and quality aspect. The industry itself is not often compromised even during tight financial conditions, given the backdrop of tightening legislation from health, safety and environmental viewpoints. Laws are drafted to ensure a reduction in personal injuries and illnesses from occurring in the workplace. Companies are increasingly budgeting for operational safety due to the disproportionately high costs associated with the current claims’ culture. These higher costs are associated with employee injuries, reduced productivity and performance, and penalties for violation of laws. Risk reduction strategies should focus on systems that give the earliest warning for hazardous situations that may occur in the industry. Using infrared (IR), line of sight, acoustic leak and point detectors, gas detection systems identify accumulations of hazardous atmospheric conditions. Many industries use a combination of detection systems in order to provide early leak detection and identification of gas accumulations or gas clouds. Each sensor type has its own purpose, with acoustic leak detectors working on sound frequency and IR sensors identifying gas build up. Response and reliability are paramount to alerting workers to the presence of gas. It is important to ensure that the detection system being used is correct for its environment. There are other issues to consider, such as the need for maintenance, access, exposure to substances, positioning, area coverage needs, reliability, sensitivity and cost. It is important to know what type of detection is required for each gas. There are four types of hazardous atmospheres that require measurement: toxic, flammable, oxygen enriched or depleted, and nitrogen enriched atmospheres. It is important to understand the gas to determine the issues within the atmosphere. The following sections look at flammable, toxic and asphyxiant gases to understand the complexities required for monitoring and detection. Combustion is a fairly simple chemical reaction in which oxygen is combined rapidly with another substance, resulting in the release of energy. This energy appears mainly as heat, sometimes in the form of flames. The igniting substance is normally a hydrocarbon compound and can be solid, liquid, vapour or gas, but only gases and vapours are considered in this article. It is also worth noting that henceforth, the terms flammable, explosive and combustible are interchangeable. The process of combustion can be represented by the well known fire triangle: oxygen, fuel and ignition source. Any monitoring or detection system for this triangle must identify and remove one of the three hazardous items. There is only a given quantity of a substance, whether gas, vapour or liquid, that will allow combustion and subsequent flammability. This quantity is between the upper explosive limit (UEL) or the lower explosive limit (LEL). The orange fragment in Figure 1 indicates the point at which flammability is likely to occur. Above the UEL the oxygen level would be insufficient in comparison to the gas, thus preventing a flammable event. Likewise, at levels below the LEL the oxygen levels would be too high when compared to the gas level, thus preventing an explosion event. The range of flammability falls between the LEL and the UEL for either each individual gas or the combination of gases. Anywhere above or below this range and the mixture becomes incapable of combustion. 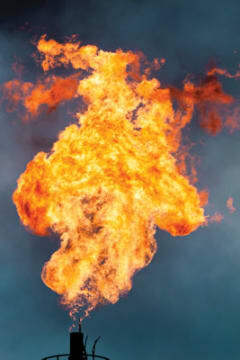 Flammable atmosphere monitoring is therefore against the normal atmospheric environment, which would be where no gases are expected under normal operating conditions, or at worst low background levels, such as Hydrogen Sulphide (H2S) sour areas. Any detection systems would therefore have a range of detection from zero to the LEL. Safety factors may reduce the concentration limits to anything from 20% to 50% of the LEL, ensuring that emergency procedures are put in to effect. By the time the LEL is reached, personal safety from flammable gases is achieved. Additionally, it is important to be aware of issues related to confined spaces. Where concentrations above the UEL are prevalent or occur in the process, this can create a hazardous environment and the potential for oxygen depletion. While attention is needed for concentrations above the UEL when confined, it is worth considering what will happen if dilution occurs. Dilution is a typical confined space hazard that occurs, for example, when the UEL is exceeded and another manifold is opened elsewhere. This potentially introduces oxygen to the system, thus diluting the level of the substance and moving the gas oxygen mix to potentially dangerous levels. Toxic gases may be, by their nature, life threatening at very low concentrations, whereas others are poisonous. H2S, for example, which is prevalent in the oil and gas industry, has a smell of rotten eggs and is regarded as such a major hazard that zoning is used to identify its concentration levels. Toxic gases can also be combustible and so detection becomes a wider issue with criteria in place for both fixed and portable detection systems. ATEX is an EU Directive 94/9/EC that stipulates the required standards for equipment and protective systems intended for use in potentially explosive atmospheres. There are different issues related to flammable and toxic gases, including legislation and various different sensors to be used. Toxic gases impact on both the environment and the worker. Legislation details the need for risk assessment, thus exposure levels need to be monitored due to the potential for inhalation, ingestion or absorption by the worker. The subsequent risks are to be mitigated with adequate controls. You can only do this if you are measuring exposure and either long or short term dose. These systems are personal dosimeters. Oxygen in the air that we breathe is at a concentration of 20.9%. Along with nitrogen, it forms the main bulk of the air that we breathe. As is similar to the LEL and UEL aspect of toxic gases, oxygen has a range whereby it can support human life. If the oxygen level hits 24% enrichment, it becomes another type of hazard as it supports the spontaneous combustion of materials such as clothing. At levels below 19% depletion human responses varies, until 6% depletion, which as seen in Figure 2, is fatal to human life. Oxygen depletion is caused by combustion, oxidation, chemical reactions and displacement, typical in confined space application. As outlined below, some of the available market detection systems include multiple gas detection, vacuum pumps and tube testers. Multiple gas detection is simple, safe and easy to use. Capable of taking several different measurements, these detectors enable the ambient monitoring of gas presence, and often have audible and visual alarm features. In conjunction with multiple gas detectors, tankscopes can be used for nitrogen enriched atmospheres and vessel entry. Vacuum pump and tube testers are used for testing the presence and precise concentrations of gas. They only require one chemical test, in which changes in the chemical’s colour indicate the level of gas. There is a lot of new and developing gas detection technology on the market. There is a great emphasis on aspects such as IR where hydrocarbons are an issue and the measurement is based on the wavelength. With this in mind, don’t necessarily focus on one aspect of the problem. There are numerous organisations, suppliers and consultants able to offer great guidance on the problem of gas safety, so if in doubt, ask.